"Community of Imam W Deen Mohammed Discussion"
"Updated Focus of Our Discussion"
Dearly beloved people, I say unto you all Peace! With your indulgence I would like to change the focus of this discussion from leadership to community building. This would include but is not limited to a discussion of leadership. Our discussion must focus all of those pertinent matters Imam W. Deen Mohammed established as most essential. To begin it is important to say that leadership for the most part has failed this community. They were completely unprepared to go forward after the Imam's passing. There are many reasons for this but most importantly none of those that are claiming leadership now had an open, frank discussion with the Imam on the subject. They did not have any questions to ask him about the time after him. They were cowardly in their approach to this subject and now we, this community, are headless. This blog has succeeded in establishing a spirit for progress. This must be maintained. Also, the contributors to this blog have emphatically thrown off and made the argument to remain free of a 'preacher' class as leaders. The principle of an 'educated' or 'learned' class that remain in the classroom of Imam W. Deen Mohammed must replace the preachers immediately. Imam Mohammed's unselfishness, innocence and pure intent are lost on these persons needing our support and calling themselves our Imams. Not one of them is regarded by our country's establishment or the responsible leadership in the world as worth any attention. We do not deserve their frivolity and pettiness, or their political mutual admiration network. We need and intend with this blog to build a national and international group of followers and students of Imam W. Deen Mohammed that will lead this community into its future. We will not remain in this pitiful state. We declare ourselves Muslims in the best tradition of Muhammed the Prophet. 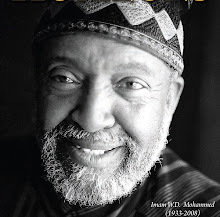 We further explain and introduce ourselves as being led and established upon that path by our leader Imam W. Deen Mohammed and from the line of Muslim African American leadership and tradition. This is who we are and who we will be. We stand upon our faith in G'd and revealed knowledge and declare ourselves the community of Imam W. Deen Mohammed.